We paid $5.00 for this machine at a flea market. Elizabeth wanted to take the motor off and use it as a bobbin winder for spinning, but Jim is holding onto the machine that still has a lot of life left in it. The 237 sold new in mid-1960s for $88.00 with case and attachments. It is very heavy and very durable. Made in Monza, Italy. Serial number is ME308450. We went through a time-period when we brought home every orphan machine we saw. Our storage space is now getting cramped, so we have become more selective in recent months regard our choices. Price does matter. We may still find room for any orphan if its price is less than $25.00. Here are a few examples of orphans we couldn't pass by. 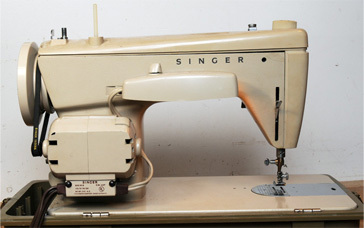 The image above shows the Singer 237 without capability to lower the feed dogs. We are grateful To Rose who supplied us a part for this machine so we could make it operational. 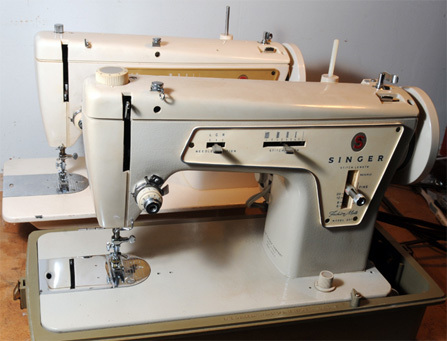 The Singer Fashion Mate Model 237 is a nice machine with little flair. It has built-in zig-zag capability and has a needle centering adjustment, which is helpful when a quilter needs a "scant" 1/4-inch seam allowance. 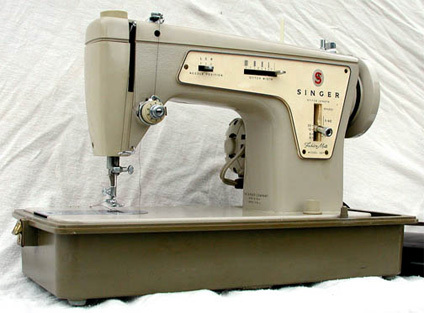 Singer 237 was made in two versions, the latter version having a knob for dropping the feed dogs and a knob for regulating the pressor foot pressure. The front machine is one of these. 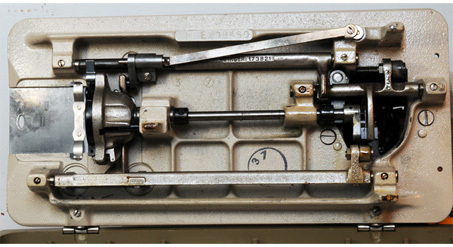 The image above shows the different pressure foot adjustment as well as the position of the tensioning used for bobbin winding. There is a slight difference in their color and plastic plate where the controls protrude. Speaking of plastic--the removable end plate and top are plastic but the remainder of the machine is heavy metal.. Serial number of the back machine is MD 002029 and does not have feed dog lowering capability. 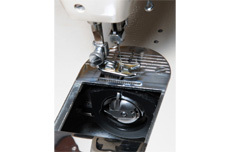 The machine uses a bobbin case which is mounted vertically. The hook oscillates. There are no plastic gears here. There is little that can go wrong with the machine if it is kept lubricated and clean. There are gears on the topside which require grease and relatively difficult to reach. The WeFixIt and VintageSingers Yahoo! groups hold the 237 in high regard, that is, high regard compared to its original price. 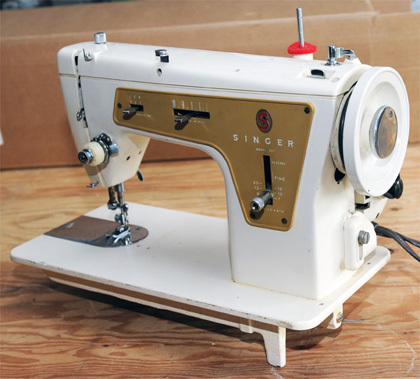 This basic straight stitch and zig-zag machine is reported to do one of the finest satin stitches in its category. The image above shows our attempt to show a satin stitch. 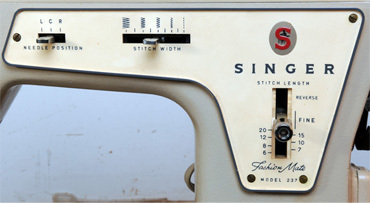 After setting the stitch length to Fine, the Zig-Zag lever was moved from wide to narrow in steps. A piece of foundation was used beneath the fabric.